My favorite fusible webbing for applique is the Steam-a-Seam 2. It's easy to trace the applique size piece I need since it is paper backed on both sides. It's pretty sticky and once you cut out the shape and place it on the wrong side of the fabric, you don't need to pin it for it to stay on the fabric. When you position the applique piece with fusible web on it onto your quilt project and press, it too will stay in place as well until you iron it down permanently. The company that makes it is warmcompany and they are located at warmcompany.com However, sometimes, it's a little stiff looking for some items such as labels on the back of the quilt some of the time. So, when I recently made the custom quilt labels this time, I wanted to try something lighter when I adhered the full label to the quilt. I tried Misty Fuse fusible webbing. 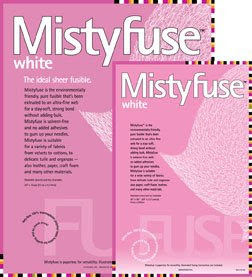 You can find more information on their website mistyfuse.com It really is very sheer and once the piece was cut out for the label and ironed on the quilt, it did produce a great flexible bond. The only problem I had was that it was so shear and without paper backing, I had problems cutting out the shape of the piece I needed. But, I'm not giving up since the product does use less paper. When I was writing this post and went to the actual Steam-A_Seam2 website, I just found out that they have a Lite Steam-A-Seam2 that produces a more flexible result. I did not know this was available and I'm pretty anxious to try it. I'll keep you posted on the results. See, we're always learning new things! i'm busy trying to finish up the hand quilting on a baby quilt that "MUST" be finished by Christmas....so nothing much going on with me!